Tan Thanh beach in the Go Cong district. 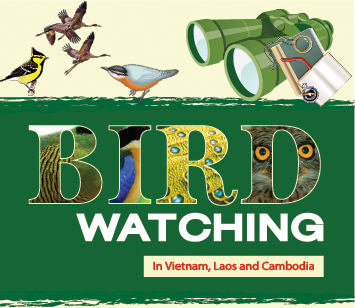 Tien Giang province is a newly-discovered shorebirding site. One of the most exciting species to be seen there is the Spoon-billed Sandpiper, which has wintered here every year since 2011; there are about 5 individuals which have regularly overwintered here during November thruogh April. Our target bird here is, of course, one of the rarest (perhaps 1,000 adult birds exist) and critically endangered bird species on Earth, the Spoon-billed Sandpiper (SBSA). However, we will also look for the rare (500-1,000 in its population) and threatened Nordmann's Greenshank, and the new taxon, "White-faced" Plover, as well as many other waders such as Broad-billed and Terek Sandpipers, Red-necked Stint and Great Knot.